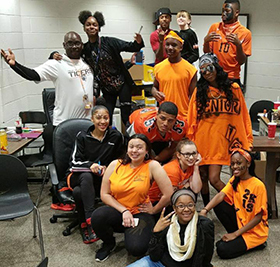 During the school year, Teen Leaders work hard to identify issues, build solutions, and plan activities to keep students engaged while mentoring, educating and inspiring younger students. 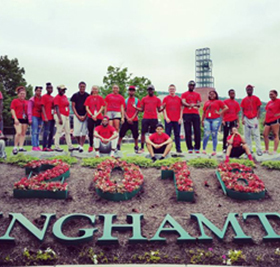 Each participating BU/LPP school offers a six-week summer program that promotes personal, social and intellectual growth, as well as civic responsibility and career exploration. Each of our signature summer service projects is a culmination of year-round engagement that keeps students on track during the summer. For four weeks a summer, Donnelly Elementary becomes a second home for campers and counselors alike. Grouped by age, kids from from kindergarten to fifth grade rotate through different science, reading and crafts stations with their counselors to engage in versatile activities and develop new skills. 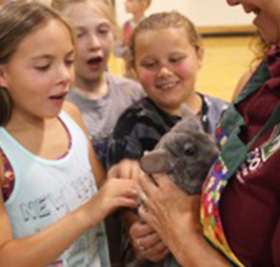 Special programming days also include activities with educators from the Ross Park Zoo, guest authors and more. 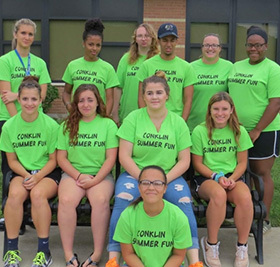 The Conklin Summer Fun Program helps campers retain their enthusiasm for learning after the school year ends, and gives Liberty Partnerships student counselors the confidence to head into the next school year with a newfound sense of responsibility and sociability. And the best part? It’s a lot of fun, too. When parents approached our Liberty Partnerships counselors about needing a summer day camp in the Conklin area, directors Tracy Parker and Sarah Masters (both Conklin natives) coordinated with BOCES Summer Youth Employment Program, the Town of Conklin, Susquehanna Valley School District and the Summer Food Program to organize a multifaceted program that truly benefits everyone in the community. 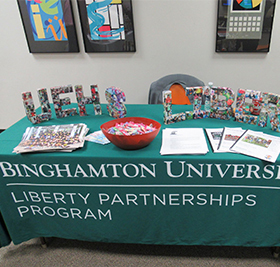 Funding from the BOCES Summer Youth Employment Program allows Liberty Partnerships students to work as paid counselors, giving many the opportunity have their first job. These student counselors undergo a week of training to learn team building skills, first aid and how to manage the Summer Food Program. 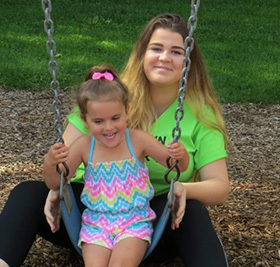 The Summer Food Program, a service through Binghamton City School District, provides breakfast and lunch to not only the campers, but also anyone in the community who’s under 18 and needs the extra help. Here at the Conklin Summer Fun Program, we cultivate the art of play and encourage meaningful relationships. And at the end of the day, we walk away having learned a little more about what it means to be a community. 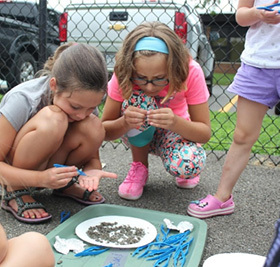 This summer, the the Owego Liberty Partnerships Program (Owego LPP) helped students re-approach their sense of connection. Everyday, electronics allow us to easily connect to our peers and the world around us. While these virtual connections are valid in their own right, Liberty Partnerships also wanted to strengthen the connection between students and the natural world. 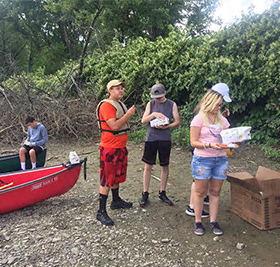 This program’s theme, “Wired to Connect,” helped Owego Free Academy students develop a better relationship with nature, themselves, each other and their community. The Owego Free Academy was led by Liberty Partnerships counselor Erika Kalgren and nationally certified therapeutic recreation specialist Brandon Cruz. Students visited the Cornell Lab of Ornithology, explored local state parks and documented over 115 acres on Habitat Network, a nature conservation project that involves mapping and identifying habitats in local communities. However, these excursions became more than just a chance to get outside. Spending time in nature gave them a chance to leave their stress behind, develop new perspectives and embrace new ways of communicating. Though Owego LPP conducted scheduled programing, the camp was truly led by what the students wanted to do. Their passion and trust in learning guided both the directors and their peers, ultimately leading to a more productive experience. In the final week of the program, students were asked to reflect on their summer to synthesize what they had learned and carry it into the next school year. Owego LPP shows that young adults are much more connected with the world than they’re often give them credit for, and at the end of the day, older generations have a lot to learn from them, too.